Human beings are like no other animal on this Earth. We were designed with a creative intellect, a conscious awareness and a decisive conscience, yet most of us misuse these fundamental abilities. Intuition as we commonly understand it, touches all of us at some point in our life. This inkling arrives as an inexplicable gut feeling or hunch about a person or situation, and often, for no good intellectual reason, can be the cause of a change of heart or direction in our life. Intuition is that extra sensory part of us that is connected to our instinct, the same survival mechanism used by the animal kingdom to survive. Our instinctive self is steered by our unconscious, the entity that unerringly drives the mechanics of our body, and taps into the universal vibration and frequencies, that make up all existence. Our Intuition works on our behalf twenty four hours a day, yet most of us are unaware of it's impact on our emotions, feelings, communication and health. Understanding and becoming aware of our intuitive self gives us the ultimate power over our lives and our own protection. Intuition is that part of us that works beneath our awareness, that speaks to us through our feeling and emotions. When we learn to listen to those messages we gain an understanding that goes far beyond our existing human intelligence. 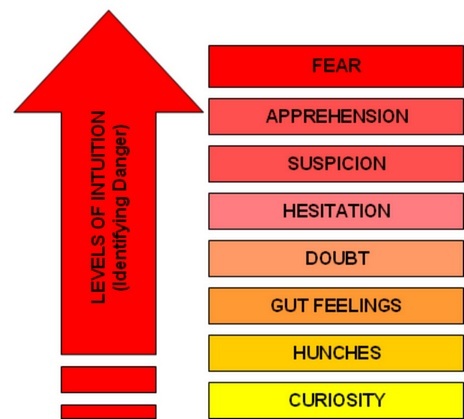 By trusting our gut feelings early, we avoid dangerous situations later on.